A bit of disclaimer here: I just started learning Node.js from this project so still consider myself a very bad Node.js developer. There might be errors or things I’m not aware of. Core, the web team working on the front-end and back-end of the app. They control every of the app itself, the looks, the interactions, the business logic, etc… They use Node.js everywhere and master it completely. How does the data go from the inside of the brain of a data scientist to the screen of a Geoblink user? Well usually, the data scientist thinks of a solution, write some Python code to do it, this Python code will modify a database, a database that the Core team will make use of to beautifully rendered data. So, the usual flow is data scientist -> Python -> Postgres Database -> Node.js -> end user. But when I joined, we started to need to make a Node.js service and a Python process talk to each other directly. The database in-between would be really superfluous, add a lot complexity, and plumb the whole service speed. That is because we needed some tools written by a Python guy to be called within a service written by a JS guy. 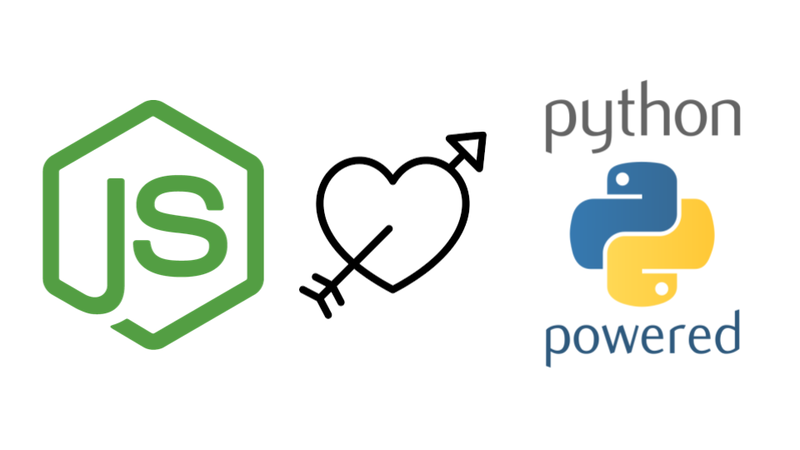 In this post I will cover how the communication between Python and Node.js evolved over time, as we had to implement this communication in different projects. The first Python tool we connected to Node was a heavy statistical model. It applies a lot of pre-processing and data-cleaning before giving the actual output and rewriting it into Node.js would have cost a lot of time and efforts. The solution we came up with was to run it via the `spawn` function of `child_process` of Node.js. We rewrote the input/output of the Python tool so that it would consume JSON from `stdin` and produce a JSON in `stdout`. Capture `stdout` from Node.js and you got a working tool! But if you do that, you might have problems with `PYTHON_PATH` or with encoding (working with Spanish and French addresses implies caring about accented letters. Enforcing UTF-8 encoding can help here). So we changed how we made the call from a Python file to a Bash file where we would export a valid `PYTHON_PATH` and do other operations. Some time later, another challenge arrived: Our service had to execute a lot of small Python scripts, each one very different from the others, each with their dependencies, some of them at the same time, but all returning the same type of data. This time, I remember deciding to fetch a package to do the job for us. In the Python universe, most of your problems can be solved by a `import antigravity`. So I went to `npm` and found `python-shell` (https://github.com/extrabacon/python-shell) that seemed to do the job. It works a bit like our previous solution: it sends the parameters to the Python script via `stdin` and gets the output via `stdout`. But, it can also support binary files, show tracebacks or execute the Python process in a child process. Most importantly, it is well tested and proven to work. With that part taken care of, the only thing left was to agree with the Python developers on a common way of writing the input/output of their scripts. Fast-forward a few months and a new project now required us to connect another tool to a Node.js service. This time, the Python tool we had to connect was a heavy application, another statistical model. It seemed like a dreamed opportunity to build a Python service! To avoid complexity, we decided to run the service in our local network. We separated the Python code into the loading of resources and the actual use of the tool. Then we prepared it so it would consume and produce a JSON, before agreeing on an endpoint and a JSON format. Do you want to control exactly the context in which Python is called? Do you want an out-of-the-box solution? Search for an already implemented library or package. Do you want a scalable solution, something you can easily reuse in you app? Take the time to create a micro-service. I like the similarities between biological evolution and choosing a solution in software engineering. There is not really a solution better than the other, but rather the best solution is the one that best fits your needs. Building a micro-service is cool, but it may not be adapted to the problem you want to solve (and will be more complex and take longer to build).